The rapid spatial expansion of Mexico City is not slowing down in the 21st century but accelerating. The main stimulus of this sprawl is income growth, which leads to widespread ownership of private automobiles and the desire of Mexican families to own homes. The number of automobiles in Metropolitan Mexico City (ZMCM) is approaching 10 million, almost double the number in 2000. Most households have access to a private car, many have several cars. Automobiles are responsible for nearly half of all trips. While the 2008–2009 economic downturn dramatically reduced new car purchases, the market has picked up significantly in 2010. New suburban residential developments for all income levels now stretch up to 40 km from the Zócalo (the main plaza in Mexico City’s center). Some developers sell undeveloped lots; others build family homes. Most of these new developments are in gated communities and are focused on car-owning buyers. 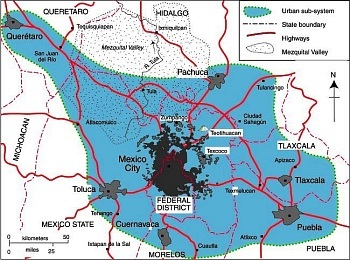 A case can be made that Mexico City is beginning to merge with surrounding urban areas (see map) into a “super city” or megalopolis, with a total population of about 30 million. The eastern border of the Toluca Metropolitan Area (population 1.6 million) is the Federal District. The Cuernavaca urban area (population 788,000) is only about 20 minutes south by toll road. The western edge of Metropolitan Puebla-Tlaxcala (population 2.1 million) is only about 30 minutes from the eastern edge of Greater Mexico City. Pachuca (population 278,000) is only about 30 minutes north. 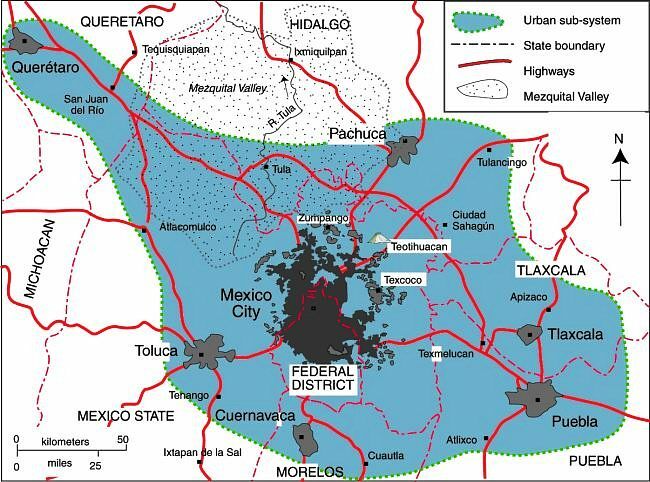 A megalopolis is one possible future scenario for Mexico City. If you have enjoyed this brief excerpt from chapter 23 of Geo-Mexico: the geography and dynamics of modern Mexico please consider purchasing your own copy of the book. Chapters 21 and 22 analyze Mexico’s 500-year transition to an urban society and the internal geography of Mexico’s cities. Chapter 23 looks at urban issues, problems and trends. To preview more parts of the book, click here and use amazon.com’s “Look Inside” feature. Driving through Mexico City is not the chaos you would imagine. Rather there is pinch-points and timing is critical – like early Sunday morning. There are travel rules. You are not allowed to travel on certain days and times based on your license plate number. It would be great to get a Post on these rules – and for the area it covers. There are so many rumors it would be good to get the facts. There is a website that Mexican citizens use but I have never found it. I would disagree with the map that is all an “urban” area. The road north of Cuernavaca to the D.F. is a pleasant drive through an agricultural belt. Similarly, the urban landscape does not start until after Teotihuacan in the northeast and certainly does not stretch all the way to Queretaro. Rather these outlying communities are satellite communities. The map also does not show well the extreme draw that all roads lead to el centro – like wheel spokes. So trying to skirt around el centro can be a challenge. Your comment about driving in Mexico City is well taken. I have always thought that traffic times for a given distance in Mexico City compared quite favorably with travel times in other large cities. Part of the reason, of course, is historical. Almost all of Mexico City’s highway system was designed after automobiles became common, and much of it was built either before, or as, the city began to sprawl. Even older roads tended to be much wider than their equivalent in many older cities, with tree-lined medians in many cases, which allowed relatively easy expansion to occur at the expense of the trees. Thanks for your valuable suggestion about including a post providing more details of Mexico City’s Day Without A Car (Día sin coche) program; look for that in the coming days. Alan, thanks for your comment. We did not mean to suggest that the entire area is urban. Rather it is part of Mexico City’s “urban sub-system” which includes its dormitory and satellite settlements as you rightly suggest. The “spokes of the wheel” characteristic of Mexico City highways (ie all heading for the city center) certainly does still hold, and is visible on the map if you click to enlarge it. However, this importance of this pattern has been reduced in recent years by new highways skirting the city, keeping more traffic out of the city center. There are challenges with finding and following some of these newer routes, mainly due to inefficient signage, but at least they do now exist, which was not the case even 20 years ago.